We are proud to present Biotouch Nutri-care hair products at a discount which is a new product line added to the Wella salon hair products. Wella Biotouch Nutri-Care is specifically designed to feed and nourish your hair with all of the nutrients it needs. 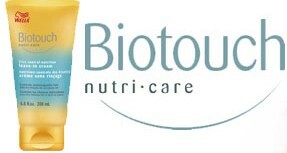 Biotouch Nutri-Care offers optimal nutrient supply to the hair to make hair healthy and strong. Specifically formulated to strengthen and protect hair from the inside out. Active ingredients such as Almond Extract, Apricot Oil and Vitamin E are used to seal in moisture, strengthen and repair hair while protecting and intensifying color.